There are over 16 million drivers on Florida roads. Thousands are killed and injured in car accidents each year. In 2016, there have been a total of 276,125 accidents, resulting in 177,366 injuries and 2,080 fatalities. Why are the odds of dying in a car accident so high compared to planes? Even though planes are controlled by humans, they have an auto-pilot feature that removes a lot of human error. Cars are operated solely by humans. In fact, according to the National Highway Traffic Safety Administration, human error is a factor in 93% of all car accidents. Most of these accidents are caused by improper lookout, speeding, or distracted driving. The truth is, you never know when an accident can happen. 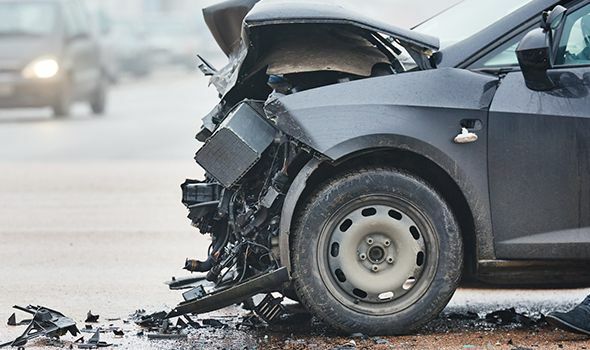 The good news is, whether you’re rear-ended, t-boned, or hit head-on, the car accident attorneys at Heintz & Becker can help you deal with the aftermath and get back on the road. According to the Insurance Information Institute, 32% of all car accidents are rear-end collisions. That’s why whiplash is one of the most common injuries seen in car accidents. Whiplash occurs during the sudden impact of a collision. It causes the head to be thrown forward, bending the neck at an extreme and unnatural angle. Whiplash can cause severe pain and muscle cramping; affecting the victim for days or weeks after the accident. Car accidents are also the leading cause of spinal cord injuries (SCIs). The same motion that causes whiplash can cause serious injury to the spinal column. Typically, SCIs result in herniated discs or fractured vertebrae, but severe SCIs can cause temporary or permanent paralysis. These injuries can cost thousands of dollars in medical bills and therapy costs. What many people don’t realize is that an accident can cause serious emotional pain and be very disruptive to your lifestyle. Thankfully, some victims receive financial compensation for their emotional suffering, as well as physical injuries. If you or a family member suffer from any of these injures after a car wreck, you might have a claim. If you need help because the bills are stacking up, schedule a free consultation with a car accident attorney at Heintz & Becker by calling 941-748-2616. If your accident was caused by another driver, you are entitled to seek financial compensation for the damages you suffered. If your accident was caused by a defective part, product, or mechanical failure, our attorneys can help you seek compensation from the manufacturer. Product liability law holds car makers accountable for any known or foreseeable safety hazards in their vehicles. Car companies have a responsibility to make sure their vehicles are crashworthy and safe. This means implementing federally mandated safety features designed to minimize injuries, prevent ejections, and reduce fire risk. When a manufacturer doesn’t do this and someone is injured, the victim may be entitled to compensation for their injuries. Many people think insurance companies are there to protect them. In a sense, that is true. For example, if you caused an accident and are at-fault, your insurance company will pay the other parties involved for their damages. Things are a bit different when you’re the victim and you’re seeking compensation from the at-fault party’s insurance provider. Insurance companies have three main goals when it comes to paying the victims of car accidents: spend as little time as possible, spend as little money as possible, and close the claim as quickly as possible. Even your own insurance company operates this way. Though they negotiate with the at-fault party’s insurer, they are not obligated to fight for your best interests. If you don’t hire an attorney, instead trusting your insurance company, you may wind up with less compensation than you deserve. An experienced car accident lawyer can help you evaluate settlements you’re offered and ensure you don’t accept less than your accident is worth. After an accident, you may be in a state of disbelief. This makes it difficult to think and handle everything that needs to be done. At Heintz & Becker, we have years of experience helping victims in Bradenton, Sarasota, and all over Florida recover millions of dollars in verdicts and settlements. We succeed because we place a strong focus victim’s rights and personalized, compassionate service. The attorneys at Heintz & Becker pride themselves on their extensive evidence gathering skills and meticulous investigation experience. We recreate your accident with help from qualified engineers and industry experts to show who is accountable. The financial aftermath of an accident can last a long time, and the physical and emotional effects can last even longer. Don’t struggle with medical bills, lost wages, rehabilitation costs, or costly vehicle repairs. Let the car accident lawyers at Heintz & Becker help you maximize your recovery. Call us today at 941-748-2916 to schedule a free consultation.